The for thursday planned deportations from Germany to the capital of Afghanistan are delayed, due to the autobombe that blasted wednesday morning in the citycentre of Kabul, which killed at least 90 people. But, the deportations were not delayed because of the dangerous situation for the people, but because the german embassy in Kabul was occupied with other things and the deportation was difficult to organise, Germany´s minister of internal affairs Thomas de Maiziere said on Wednesday. The people who should be deported are still kept in a detentioncentre until their deportation would take place since they should be rescheduled ´as soon as possible´. The detention of the people is also due to the new law in Germany which makes it easier to put humans -including children-, who the government want to deport, behind bars. Only after a lot of protests in different cities in Germany and to much political and media attention to this topic, the German government decided to delay the deportations for one month. Then, they would check the situation in Afghanistan again. Also, there is no news about the people who were deported from Schweden and Denmark to Kabul earlier this week, no news about if they are still alive or if they are part of the 90 people that died. It is inhuman to deport people to a place like Afghanistan now is, where there is ´war everyday´, one refugee from the province Barlan told us personally. So deportations to Afghanistan should never happen again. Because of the closing of the Balkanroute in March 2016, less people are newly arriving in Germany which allows the BAMF (Federal Office for Migration and Refugees) to work on the existing open asylum applications. It seems like they are trying to process every application really fast, but with which goal? ´The year of 2017 must be marked by deportations´, Horst Seehofer, another German politician said which was confirmed by de Maiziere in the REPORT MAINZ. At the same time, de Maiziere suggests that especially people who are accused of doing crimes should be deported back -to Afghanistan-. 1. The only possible way to get an asylum in the EU is to go there illegally because of the two facts that you have to be on the territory of a country to apply for asylum and that there are no ´legal ways´ to get into the EU countries. 2. 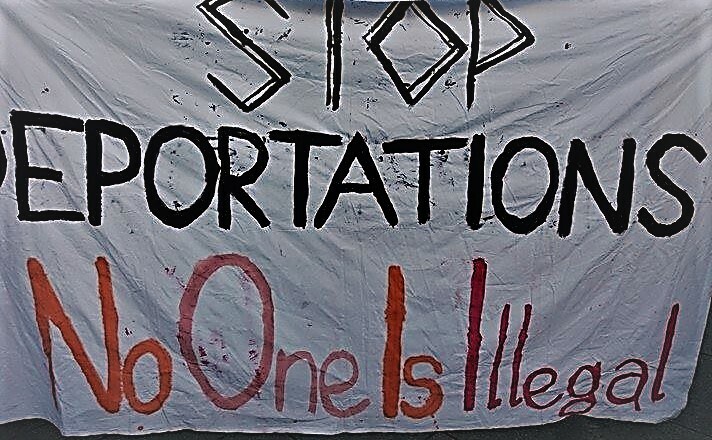 People who are crossing the borders face terrible police violence and silenced push backs. 3. There fingerprints will be collected in Eurodac, an exsiting database where in the future facerecognition may be added, as if they commited a crime. 4. In the planned changes of the Commen European Asylum System (CEAS) when they arrive in a country where they ask for asylum they can be detained during the asylum procedure. 5. When they don´t get a status, they can be put in prisons for an undecided time, until they will be deported. Draw your own conclusions and become active now with us against Fortress Europe and the CEAS! Update Enough is Enough: On Thursday evening the German government announced that deportations to Afghanistan are partly and temporary halted “to examine the situation”. Yes they do.. day by day.